12Blessed is the one who perseveres under trial because, having stood the test, that person will receive the crown of life that the Lord has promised to those who love him. 13When tempted, no one should say, “God is tempting me.” For God cannot be tempted by evil, nor does he tempt anyone; 14but each person is tempted when they are dragged away by their own evil desire and enticed. 15Then, after desire has conceived, it gives birth to sin; and sin, when it is full-grown, gives birth to death. 16Don’t be deceived, my dear brothers and sisters. 17Every good and perfect gift is from above, coming down from the Father of the heavenly lights, who does not change like shifting shadows. 18He chose to give us birth through the word of truth, that we might be a kind of firstfruits of all he created. Patrick won the jackpot. Alice struck the lottery. Michael received the first prize in a lucky draw. With the winnings, all of them rejoiced. All of them claimed to have been blessed. All of them said that the good fortunes were all gifts from God. With glee, they promised to give a tenth of what they had gained to either a Church, a charity, or some kind of a Samaritan initiative. Of course, we can debate about whether Christians ought to gamble or buy lottery, but that is not the point today. the point is, what constitutes a "good and perfect gift?" There was an old story that talked about a man with one horse in his farm. One day, his horse ran away as his wife failed to shut the gate properly. "What bad luck! Why must this happen to me?" cried the man. The following day, the owner's runaway horse returned, with three other wild horses. "Fantastic! The heavens must be smiling on me!" exclaimed the happy farmer. A few days later, his teenage son wanted to ride on one of the horses. The happy father then carefully helped his son on the horse, taking care of all possible safety measures. After a few happy moments, the horse suddenly jerked upward, flipping the young man to the ground. The son broke his leg. "What bad luck! This horse is a curse!" the man scolded the horse. A month later, a group of government officials came to enlist eligible young men for the army. On their list was the name of the farmer's son. Due to the broken leg, the son was given a pass. "Thank the heavens. The broken leg is actually good fortune for us." said the old farmer. I smiled as I read the story. People's definition of what is good and what is bad appears to shift as quickly as the wind. What is good fortune today can be pretty bad luck tomorrow. We often read about lottery winners who confessed that their winnings appear a be blessings, but turned out to be curses instead. Robert Pagliarini studied the financial and psychological issues of sudden windfalls, and saw how various winners termed their winnings as curses. In "Why Lottery Winners Crash After a Big Win," Pagiarini brought together several stories of how one stroke of luck led to multiple cases of them losing their privacy, sudden lawsuits, drug addictions, and an addiction to a worldly definition of happiness that does not last. The problem is that winners overestimate their "honeymoon stage" of winning, which allowed the money they won to control their lives instead of them controlling the effects of the winnings. It is common to hear Christians say: "God has blessed me" the moment they get a good result or see a wonderful turn of events. Are they right when the blessing remained a blessing? Are they wrong when the blessing somehow turned into a curse? What then is a blessing? What is that "good and perfect gift?" In order to understand the context of these verses, let us check out the progression of the gift. In a nutshell, if a gift is "good and perfect," there is a trend of growth. Verses 14 and 15 summarizes the fall and decay of mankind in two verses. It begins as a seed of "evil desire." With the combination of water and soil that to enable conception, the seed germinates and gives "birth to sin." Sin grows up and when "full grown" gives birth to death. The whole progression of movement is toward death and dying. That is what sin entails. Is this the "good and perfect gift" that is from above? No. It is something that is not from God. Any gift that leads to a decline is not from God. On the other hand, verses 17 and 18 remind us that the gift from God is showered upon us, that we may be birthed "through the word of life" (which is Jesus Christ) and be the "firstfruits" (as we are reconciled to God and be fruitful in him). There is a progression of good to better, and better to best. In the hands of Almighty God, we grow to be the best gift for God, holiness. Any gift that leads to a progression of growth toward life is from God. Only the Life-Giver can bring life. Those of us who buy groceries will often look at freshness of our produce. Whether we are buying dairy products or canned food, we look at their expiry dates. The longer the better. There is one product that continues to impress me. Honey. It is natural. It is long lasting. It gives us a glimpse of eternity. If you check out the shelf life of honey, you will notice that many people say honey lasts forever. It never goes bad. Honey is good food. The old Testament describes the promise of God using the words, "land flowing with milk and honey." Samson (Judges 14) and David (1 Sam 14:29) have also been strengthened by consuming natural honey. Like honey in the rock, the Word of God strengthens us. the Word of God gives us life. The Word of God is eternity focused and gives us eyes to be heavenly inclined. All good and perfect gifts are from God. They do not simply shift according to the winds or sway according to the latest fads or trends. They are eternity focused and will last forever. What is it in James 1 that will be deemed "good and perfect gift?" We may not sense it in its fullness yet, but we can see it in its fruits. Note James' description of the good and perfect gift that results in "firstfruits." It is one thing to get results. It is yet another to get results in a way that is honorable to God. How we go about blessing others with anything from above is equally important. God may choose to bless some of us, but how are we using the gifts for the glory of God? How are we blessing our neighbours? How are we loving people within our circles of influence? While there are rich misers who do not share or make use of their fortunes, there are also people who willingly give of what they have so that others can benefit. The example of one Chuck Fenney is a powerful example of humble giving. He is founder of the famous DFS organization that deals with duty-free shopping. For more than 30 years, he has focused his efforts on giving away his fortune. Now 83, he is planning to shut down his charity organization once his money has all been given away. Last year, I read reports that his fortune had fallen to only US$2 million, down from a high of US$7.5 billion. What is most impressive is not his amount of giving, but in the manner that he does it all. He dresses very simply. He lives very humbly. He shuns the limelight and is often making his rounds in secret. Just the fact that it takes so long before the press gets wind of his deeds is a case in point. 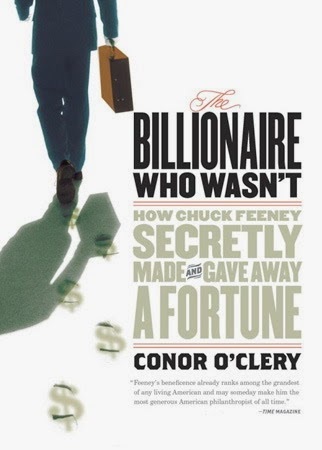 That is why a book has been written about him entitled, "The Billionaire Who Wasn't: How Chuck Fenney Secretly Made and Give Away a Fortune." He is a legend in the making. That is how God works as he showers us with "good and perfect gifts." We are to humbly receive them. We are to boldly use them for the glory of God. We are to generously utilize them for loving our neighbours. We do all these in secret, so that the power and majesty of God can be manifest. Let me summarize. A good and perfect gift is not defined by the world but only by God. There is a progression of good toward giving the best for God. There is an eternity focus, not temporal. People with such good and perfect gifts will use it meekly and modestly.